Lightning can be beautiful, but it can also be deadly. 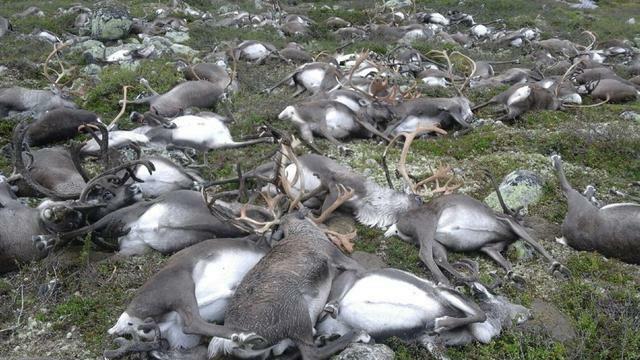 Such was the case in Hardangervidda, Norway where a strike claimed the lives of 323 reindeer. The exact circumstances surrounding the mass deaths are unknown, but a spokesperson for the Norwegian Nature Inspectorate said, "We've heard about animals being struck by lightning and killed, but I don't remember hearing about lightning killing animals on this scale before. We don't know if it was one or more lighting strike; that would only be speculation." Officials also noted the animals may have huddled together out of fear when the storm came in, reports Time.